WhereArtI Monday and another Edinburgh location for you to find. This one is a favourite of mine, a place to relax in beautiful surroundings, but can you name it? Plus this week the WhereArtI returns to the pages of the Edinburgh Evening News with a brand new sponsor and a fantastic prize each week. Each week you could win a bottle of Edinburgh Gin plus a tour of their city centre distillery. Buy a copy today to find out more. 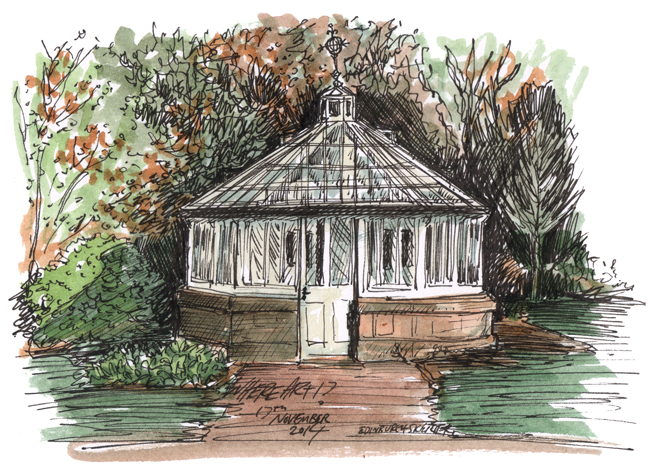 This is the Glasshouse at Lauriston Castle, which has great views over the Forth of Firth and is a beautiful, peaceful place to visit. Well done @lemon_squeezy (3pts), @0apropos (2pts), Lorraine Guthrie (1pt). I don’t know but I want to go there ! CA Husted liked this on Facebook. Emily Graham liked this on Facebook. Janet Wyllie liked this on Facebook. @edinsketcher @edinburghpaper @edinburgh @EdinBlogger muirhouse shopping centre ? Nemesis liked this on Facebook. Looks like my favourite place also – Lauriston Castle!